I had everything we need for our vacation. The staff was knowledgeablestablished and friendly. Love the property. I recommend this property as well as the property management. It was wonderful not having to book for a week. Carts for arrival and departure are always and issue; suggest a different system. This particular condo may want to consider upgrading the stove This was our third year to Navarre and as always we enjoyed it! Thank you. I was very impressed. I very much enjoyed my stay, didn't want to leave and look forward to coming back next year! Thank you! Best Vacation Ever! We had a blast. Hopefully can save enough to come back again sometime. The staff was personable and professional. We love the area and the unit we stayed in. We have stayed in the same unit two years in a row and looking forward to our third! When our internet service, TV, and phone service were interrupted by the wires coming into the condo being cut, the customer service staff were diligent in trying to get the MediaCom service people to come to repair our problem. Todd, who worked in the Navarre Properties office, was very helpful, even coming to the condo to see if he could fix our problem. Since our service interruption occurred on Saturday, it was Tuesday before it was repaired, but the staff tried their best to help us through this time. We love, love, love this condo! this was our 2nd year to stay here, and it fits our family of 8 perfectly! Aside from our tv and internet service interruption for 3 days, our stay was fabulous. Our children and grands said that they would love to come back again next year! The reservation team was friendly, responsive and easy to work with. Great location right by the bridge! Steps away from the beautiful white sands of the beach. 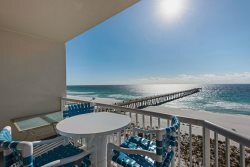 I really enjoyed the visit to summerwinds at Navarre Beach, everything was great, i have no complaints. I would stay at the Summerwinds again in the future.